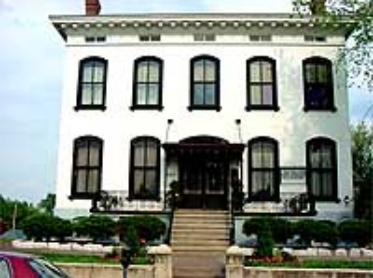 The PROS Team made our way to the Lemp Inn in St. Louis, MO. We were there for one night before going to the Crescent Hotel in Eureka Springs Arkansas. When we arrived, there was a wedding party in the garden area. It was Labor Day Weekend of 2005. PROS would have the Lemp to ourselves except for a newly wed couple. We began our sweep around 8:30 pm. There is a lot of EMF there, and this could be why so many people claim to see things. We did see a shadow pass in the area near the staircase. We were unable to replicate the event. We did capture some anomalies with the cameras. Ron had several EVP's. The experience was great, however it should be said that from the data we gathered we were left unable to determine if there is truly paranormal activity at this beautiful location. PROS will return with open minds and the latest techniques use in research to seek the answer. You will hear a low male voice say, "Catch." Another low male voice then says, "Stop your whispering," followed by, "Hard as you can get to room." Next a louder male voice is heard saying, "There is none." One PROS Team member says to another, "Sweep the hall," and as the other Team member asks, "Which way?" a low male voice is heard saying "Hall." The last two EVP's are male voices saying, "Go ahead, run out," and "Something bright." Front of the Lemp Inn.